In multiple sclerosis (MS), damage to nerve fibers in the central nervous system impairs the signaling that occurs between your nerves and muscles. As a result, muscle weakness, spasticity, and a loss of coordination may occur. You may experience some of these issues early in your disease course (and they may worsen with time), or they may arise as your MS advances. Here are the three most common types of muscle issues you may experience with MS and what can be done about them. If you start to experience any related symptoms, it's important that you raise them to your doctor. Muscle weakness in MS is more than simply having a lack of energy or not having the strength to lift a heavy dumbbell. Rather, it's having genuine difficulty moving your muscles, almost like they are too wobbly or tired to work. While muscle weakness can occur anywhere within the body, it's most noticeable in the limbs. 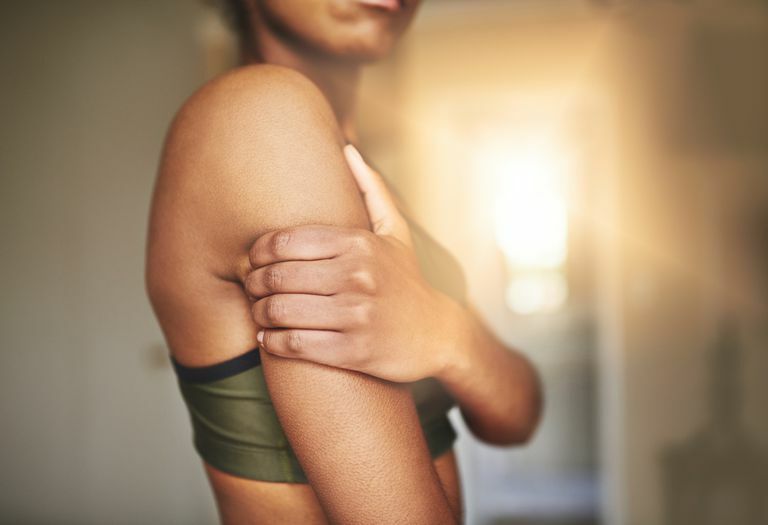 Weakness in the arms and legs can be quite disabling, too, as it can lead to problems walking, showering, dressing, and completing other basic activities of daily living. One common example of a complication of muscle weakness in MS is foot drop, which is when you cannot lift the front part of your foot. Foot drop occurs as a result of poor nerve signaling to the muscles used to flex your foot. To compensate for this symptom, a person may drag their toes or adopt a certain walking pattern, like swinging their leg out. Coping with muscle weakness first entails teasing out the source: the disease itself (from demyelination of nerves in the brain and/or spinal cord) or a lack of muscle use. If the former, muscle strengthening with weights (resistance training) will not be helpful; in fact, it may worsen your weakness. The best thing you can do is find a physical therapist (PT) who has experience working with patients with MS. A PT can help you figure out which muscles have impaired vs. healthy nerve signaling. You can then learn to strengthen and maintain the tone of the muscles that are receiving proper nerve signals. A physical therapist can also recommend assistive devices. For example, an ankle-foot orthotic is often used to treat foot drop in MS. It's also a good idea to obtain a referral from your doctor for an occupational therapist—someone who can help you devise a home and/or work environment that is safe and optimizes muscle energy conservation. If your muscle weakness does stem from disuse (perhaps you have disabling fatigue or are in a wheelchair), then strengthening your muscles through a weight-training and exercise program can be helpful. It's important to treat the cause behind your muscle disuse, if possible. For instance, if fatigue is the culprit, you may consider better sleep habits, energy conservation strategies, or even taking a prescription medication like Provigil (modafinil) or Ritalin (methylphenidate). Exercise can help fatigue, as well. In MS, increased muscle tone or muscle tightness (spasticity) occurs as a result of loss of myelin sheath (demyelination) in the pathways that carry motor signals from the brain. Due to these damaged pathways, nerve signaling to the muscles is slowed, which can cause a person's muscles to harden and clench up on their own. As a result of spasticity, the muscles may spasm and/or become rigid and stiff—and this can be quite painful. Over time, a person may stop using certain muscles due to spasticity, and this can lead to muscle atrophy (when a muscle wastes away, appearing smaller). Likewise, with severe stiffness, a person can develop contractures—when a joint becomes frozen in place, due to shortening of the muscle. The downside of these medications is that they may cause tiredness or muscle weakness, which can complicate movement challenges. Other medical options include the anticonvulsant Neurontin (gabapentin), Botox injections that go directly into the muscle, or a baclofen pump placed in a person's abdomen. In combination with, or in lieu of, medication, rehabilitation with a physical and occupational therapist is a key component to managing spasticity in MS. A rehabilitation therapist can teach you specific stretching exercises, as well as how to prevent contractures. In addition to rehabilitation therapy, alternative therapies are often used to cope with spasticity. Some of these alternative therapies include yoga, massage, biofeedback, and medical marijuana. Lastly, avoiding or minimizing triggers of spasticity is important. Common ones include excessive heat, a rise in your body's internal temperature (for example, fever), a full bladder, and irritating or tight clothes. Treating infections and pain promptly can also help prevent muscle spasms and stiffness. A loss of coordination or balance in MS stems, in large part, from muscle problems, especially muscle weakness and spasticity. Other MS-related factors that contribute to a loss of coordination are blurry vision, vertigo, and sensory problems, like numbness in the legs. One of the biggest concerns with a loss of coordination is falling. This is because a person with balance problems may adopt a swaying, clumsy walking pattern (called ataxia). According to a large 2015 analysis, in people with MS (across a broad age range and disease severity), the average fall rate is approximately one fall per month. Other research has shown that about 50 percent of middle-age and older people with MS experience at least one fall over a six-month period. Treating balance problems in MS involves a thorough examination by your doctor to decipher the primary cause. For example, if muscle weakness is the likely culprit behind your loss of coordination, then an assistive device like a cane or walker may be useful, as well as performing exercises that strengthen certain muscles in your legs and trunk. Even more, while an exercise program will improve your muscle strength, research shows it can also improve other symptoms of MS like fatigue, depression, and cognitive problems. If vertigo—a common symptom in MS—is disrupting your balance, balance training exercises may be helpful. An occupational therapist can also work with you to ensure your home is safe. Ideas may include getting rid of loose rugs, ensuring lighting is adequate, and installing handrails. Multiple sclerosis can lead to debilitating, even painful muscular problems. Fortunately, medications and rehabilitation can provide relief. Even if you are experiencing only mild muscle symptoms, it's reasonable to talk with your doctor about seeing a physical therapist, who can provide strategies and exercises geared toward improving unique muscle symptoms.